How do I disable the Download This Video option? If you don't wish to see the Download This Video button when watching videos online, you can easily turn it off by following the steps below--be sure to close and restart your web browser after performing the steps. 1. 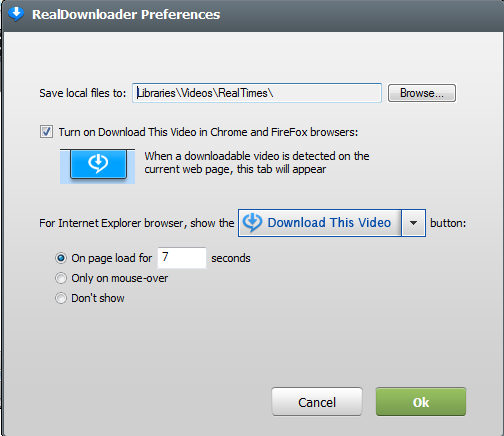 Click the Start button at the bottom left of your computer screen, and navigate to All Programs > RealNetworks > RealDownloader. 3. In the Preferences window, uncheck "Turn on Download This Video in Chrome, Edge and FireFox Browsers" and click the radio button next to "Don't show". Click Ok. If you are still seeing the Download This Video button after following these instructions, please shut down and restart your computer. Your new preferences should then take effect. Can I download any video?